Take a tour of Givat Ram, exploring the three branches of authority that form Israeli democracy and the nerve center of modern Israel’s governance. In the winter of 1949 the government of <?xml:namespace prefix = st1 ns = "urn:schemas-microsoft-com:office:smarttags" />Israel, under the leadership of David Ben Gurion, decided to transfer its seat to Jerusalem. 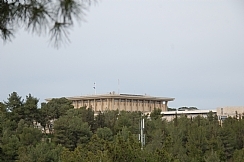 The chosen site was a hill in west Jerusalem, which earned the name “Givat Ram.” The government buildings began to be built, and today this hill houses all government branches and most government ministries. During the tour we will explore the relationship among the different branches of authority, discuss the dilemmas of a democratic and Jewish state, and hear some of the local stories. We will learn about the link between the Knesset and the temples of Greece, between the Bank of Israel and the Louvre, and between the Supreme Court and the Western Wall. The sites of the tour include the Supreme Court, the Bank of Israel, the Rose Garden, the Knesset Menorah, and the Knesset.